Is Alexa the most popular name in your home? “Alexa, order dog food”, “Alexa, play country music”, or my kids’ favorite—“Alexa, tell me a joke.” I don’t know about you, but the first part of my morning routine is to ask “Alexa, what’s the weather today?” What if you could ask Amazon Alexa about weather conditions in your backyard or she could tell you the temperature in the baby’s room? Well, now you can!! The new AcuRite® Access™ now has the capability to connect to Amazon Echo. 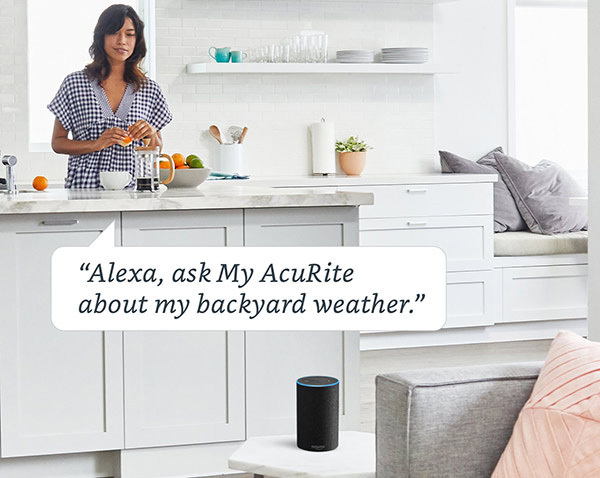 "Alexa, ask My AcuRite what are my current conditions"
"Alexa, ask My AcuRite about my backyard weather"
With these simple commands at your disposal, you will have quick access to the information you need to ensure that your family is prepared for the day’s conditions and get everyone out the door geared up for the day. Umbrella? Check. Winter coat? Check. Sunscreen? Check. You get the idea. Planning your Day with Confidence on those hectic mornings just got even easier. The integration of AcuRite Access with Amazon Echo is just the start of AcuRite integrating with the technology that you rely on daily in your smart home. As a busy mom, I can't wait to enable the My AcuRite skill on Amazon Alexa to make my life easier. Already have an AcuRite Access? Enable the skill today and let us know what you think. Just added the AcuRite Skill to my Alexa. Works like a charm! The Alexa skill works quite well for me. I look forward to the growth of Alexa app functionality such as joe C suggested and customizing the Alexa app. This is a great start and a welcome addition to my Alexa home! When will the Skill be available in Canada? We are working on improving the skill for the US, then we will work on making it available in Canada. Thanks for your patience in the meantime! I have two Acurite home bases (in two different houses) and each has several sensors. Is there a way to ask Alexa about a particular home or even a particular sensor? Right now, she only gives me the report for one of the sensorts and it isn't even for ona at the home I am at!! Currently, when you ask Alexa "Alexa, ask My AcuRite my backyard weather" she will read the sensor data in order of your sensors listed in your My AcuRite account. She should then ask if you would like to hear another, and if you say yes, she should continue reading through your list of sensors. We are currently working on additional skills like requesting Alexa to read specific sensors based on the names you have assigned them. It would be great to be able to ask about a specific sensor. It would be nice to be able to ask for a specific measurement like temperature instead of all conditions. I agree! We are working on adding both of these skills referring to a specific sensor or a specific measurement. Thanks for your patience in the meantime. When do you get it setup for Google Home? We are also working on setting up My AcuRite with Google Home, we hope to have it functioning by the end of the year. That is Great and I look forward to using the two products together. Any news about my integration with Google home? There are no new updates at this time regarding Google Home integration. If we decide to release an integration we will be sure to notify the community. In the meantime we recommend signing up for email notifications if you haven't already so that you will always know about new releases. When will Google Home be available? We don't currently have a date as to when that feature will be available. We recommend signing up for emails so that if it becomes available, you will be notified. No doubt Alexa is the market leader right now. But there are some issues in Alexa. If you are also facing the some issues then you can contact netgear router support usa. They are the best customer service provider of Alexa. No AcuRite for Canada???? Why? I sure hope you'll also have AccuRite work with Apple HomePod. I just got this setup yesterday. Works great! A graphical interface on the Echo Show would be a wonderful update down the road. Also, specific sensors and specific measurements would be ideal and it looks like you're working on that. It's not available in Canada yet! Bummer. When? When?